Romance. Action. Melodrama. Torture. Death. Combine these things together and it spells out “China Seas,” a film from 1935. This is another one of those “Lady Mary” roles Rosalind Russell was already beginning to tire of. She once wrote, “I was always taking Clark Gable or Bob Montgomery away from Jean Harlow or Joan Crawford. Temporarily. It was ludicrous” (Life is a Banquet). This was one of those occasions—this time Clark Gable from Jean Harlow. 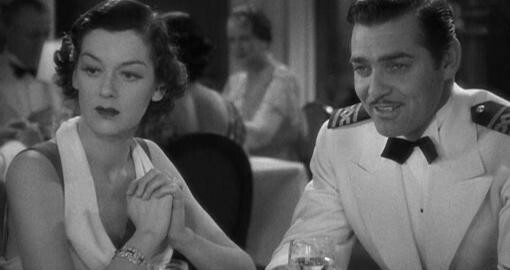 Rosalind played a rich English woman named Sybil Barkley, but Mr. Barkley is now dead and she is a widow, following an old flame of hers, played by Clark Gable, on the boat of which he is captain. The film opens on the boat which will sail the China seas, like the title suggests. The voyage will be starting soon, but the captain is not yet on board. Without him around to hear, a few of the workers express their disdain for him and how he will probably arrive, hung over and grumpy. He does finally arrive and his crew could not be more correct about his attitude. It is in the opening scene where we meet some colorful characters played competently by great character actors. One is C. Aubrey Smith, who plays Sir Guy, an old (also grumpy) man who owns the line of China seas ships and tries to watch over Captain Alan Gaskell (Clark Gable). Also along for the ride are passengers such as constantly soused writer McCaleb (played hilariously by dependable Robert Benchley) and Timmons (Edward Brophy), the gap-toothed, New York accented man married to a beautiful girl (Lillian Bond), who seems to have some tricks up her sleeve. Also, there is Dudley Digges, who plays Dawson, a crew man who is always drinking before he gets to work, and who is constantly being chastised by his captain for doing so or for having chewing tobacco in his mouth. Lewis Stone plays a rather withdrawn man named Davids, who has a bad reputation of being a coward while working on a ship. Finally, among this seemingly large cast are two of the leads, Jean Harlow and Wallace Beery. Jean Harlow plays a brassy, uneducated, buxom blonde named China Doll (or Dolly) who was involved with Captain Gaskell at one time, and still can’t get him off her mind. Wallace Beery plays Jamesy MacArdle, a criminal who is in cahoots with pirates and wants to attempt to take gold that he is sure is on the ship. Beery also exhibits a slight Irish accent in his role, which is interesting. Shortly before the ship is about to take off, a classy British woman comes aboard. It’s Sybil and Gaskell is almost bowled over that she has materialized before him. He was in love with her some years ago, but could never act on it because she was married. However, he knows that she is now a widow and suddenly has stars in his eyes. She mentions to him that she “is now in his hands” and his temperament soon changes after their meeting. The voyage has started and Dolly, forever without shame, bursts into Gaskell’s compartment and mentions the “English dame” she saw him talking to. She is jealous of any woman he makes eyes at and Sybil is certainly no exception. She describes Sybil as looking like she was “smelling a dead fish or something.” Gaskell laughs it off as a joke and later that night, they all sit at a big table to have dinner and Dolly is envious of Sybil because she is allowed to sit next to Gaskell by the head of the table. Sybil has very polished manners and appears to be charming Gaskell into making “goo-goo eyes” at her… or so it seems to Dolly. And Dolly’s green-eyed monster shows its true colors when she interrupts Sybil as she is talking about her native England with another wealthy, worldly woman named Miss Yu Lan (played by Soo Yong). Dolly starts in with her loud, obtrusive voice, making a mockery of English society women like Sybil and even pretends to put a monocle over her eye, thinking that sums up dull English women in a nutshell. Sybil simply smiles at her and tells Dolly that she must really be in love with Alan if she is willing to humiliate herself that way. She excuses herself and Gaskell glares at Dolly, having had enough of her embarrassing him with stories of his darkest moments. When Dolly goes to Gaskell’s cabin to apologize for her behavior the night before, she tells him maybe there aren’t enough male versions of Sybil to go around. He responds by saying, “The real trouble is there aren’t enough female Mrs. Barkleys.” Although Harlow is a major scene stealer in this film and is constantly barking at Clark Gable, who barks back just as loudly, something great going for Roz is her costumes (again). She wears beautiful gowns that appear to be mostly white, although it is hard to tell in black and white. They are expensive-looking, very lovely, and could not make her stand out more. A personal favorite of mine is the adorable polka dot number she wears the day after the eventful dinner. It is important to note how excited Sybil is to be on the ship and how she seems almost itching to see a dangerous storm or something of that magnitude to take over the ship. After Gaskell and Sybil decide they will get married when they get to Singapore, a storm just like Sybil had heard about begins to brew. It causes chaos and tragedy as large objects move from one side of the ship to the other. Gaskell even saves a little girl from being crushed by a piano that was barreling toward her. On the dock, there are steam rollers that horrifyingly crush a few of the men aboard. And the horror doesn’t stop there. Soon after the storm, the ship is taken over by pirates with whom Jamesy is working. They are sure there is gold aboard, so they torture Gaskell with the “Malay boot” in order to pry information from him. The Malay Boot is an ancient torture device that was put around the victim’s foot and as they are being tortured, the spikes or iron vises inside would put pressure on the foot, crushing it if enough was applied. Naturally, Gaskell constantly passes out from the pain until Jamesy decides he doesn’t know anything about the gold because no man could possibly be that tough. Meanwhile, Dolly has been forced to work with Jamesy after she accidentally finds out what he is up to. She gets him the key to the arsenal so that the pirates can take over the ship. The next day, the pirates have been overcome by the ship’s crew, especially Davids, who risked his life (contrary to his reputation) by setting off a bomb near some pirates. Gaskell is using a cane to get around on his bandaged foot. Dolly doesn’t want Gaskell to get into any trouble and tells him that “When a woman can love a man right down to her fingertips, she can hate him the same way,” even though both Gaskell and the audience know that she can only love him. When Sybil makes her sudden reappearance, it is only to be told that he can’t marry her. Not only does he not want to involve Sybil in the scandal, but a house in Sussex is not really for him and he could not possibly love any woman more than he does Dolly. Referring to Jamesy’s previous line about no man possibly being that tough, Alan Gaskell in fact is. There was gold on the ship, but it was hidden in the steamroller, and he never let it slip while being tortured. This is a very good film just chock full of so many different genres and such a large cast, each individual character having their own story. I would recommend it to anyone, especially to Clark Gable and Jean Harlow fans. They are at their best in this film and it is rather thrilling to watch them scream at each other as only Clark Gable and Jean Harlow could.